Tomatoes with bacon, tomatoes with cream, tomatoes on toast or in salads supreme! At the height of our tomato harvest, with colored peppers blending in the mix, each evening’s supper features tomatoes. When “shrimp” was whispered in my ear one night, I set about answering the request the next day. 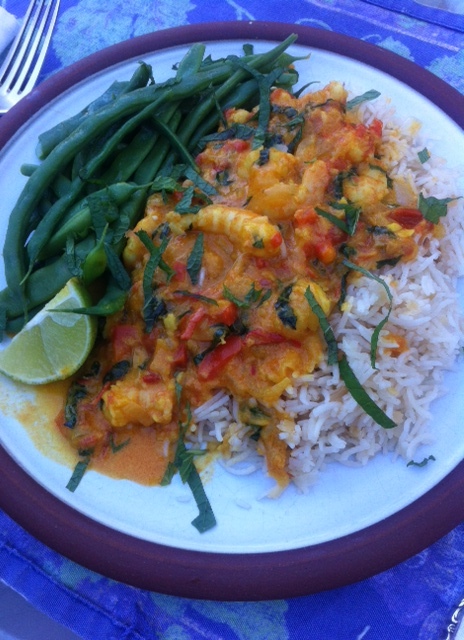 Sweet gulf shrimp with tomatoes and coconut milk makes magic flavor found in tropical cuisines from Brazil to India. The stew may be sparked with spices or kept simple without. Either way it’s a food pairing not to be missed. The rich creaminess of coconut milk tempers any tartness in the tomatoes, enriches the juice and bathes the shrimp in a sumptuous sauce. Fresh tomatoes melt into the stew in a way that canned tomatoes treated with citric acid can’t approach. Adding ginger, chili, and turmeric gives the dish an East Indian flair. Leaving those ingredients out gives a comfort level even a two-year-old will enjoy. These days it’s important to check the source of your shrimp. I highly recommend American gulf shrimp if they are available. We’ve all been reminded of the often unsanitary conditions of Thai shrimp farms. For the sweetest, tenderest morsels, know the origin of your shrimp, and buy shell on shrimp. To ease your dinner preparation, simmer the sauce base ahead or even the day before. For a quick meal, steam some rice, blanch a green vegetable, simmer the shrimp in the sauce, and toss a salad. *Use fresh chili at your own comfort level. I always taste-test my chili first since it will vary in its heat. Use the seeds for more chili kick, or remove the seeds for a milder flavor. **Save seedy bit from tomato interior. Strain out seeds and use juice as needed. In a heavy saucepan warm the oil and sweat the sliced onion, covered with butter wrappers, until wilted and translucent. Add sweet red pepper and continue to sauté until the onion just tinges with gold. Stir in the ginger, garlic and chili, cooking until the spices are fragrant. Stir in turmeric, tomatoes, and cover. Reduce heat and simmer until tomatoes are completely tender and broken apart. If needed add a little water or the strained tomato juice. Add coconut milk, season generously with salt and simmer to combine flavors. While the sauce is cooking, peel the shrimp, season lightly with salt, and refrigerate until needed. Shortly before serving, add shrimp to the simmering sauce and cook only 3-5 minutes or just until the shrimp are pink and cooked through. Add fresh cilantro or mint plus lime juice to taste, and serve with white rice or a simple pilaf. Enough for 4-5. Every Saturday since early July we’ve met Pablo next to the big galvanized horse trough heaped with ripe ears of sweet corn in our farmers’ market. $6 a dozen, then $5, and now $4. Each week we bring home another bag packed with the lush grain. I throw the outer husks on the compost pile, stash neat ears in the fridge. I for one am quickly corn-on-the-cobbed out, but happy to have the crisp kernels for pilafs, vegetable salads, succotash, soups, and polenta. Now that we’ve come through a two-month corn cycle, the colored peppers are reddening, and it’s time for corn relish. Popular throughout the Midwest, the corn relish we know seems to have Germanic origins from Pennsylvania Dutch immigrant farmers. These frugal people—expert preservers, always finding ways to use every scrap of food—corn relish was an end-of-summer means to blend garden vegetables into a savory pickle to can for winter. In some old cookbooks the relish is called corn salad, found in the canning section. Here’s a sweet/tart condiment that could be served with roast chicken, sausages or a supper of leftovers—and stand in for fresh greens no longer a part of winter’s larder. Once you’re corned out and ready to leave those golden cobs until next summer, try to gather a few more along with some red peppers, onions, cabbage or celery and simmer even a small pot of old-fashioned corn relish. It’s pretty, lively, tasty, and here given a zesty boost with some fresh ginger, garlic and chili. It’s a welcome end of summer treat before the frost is on the punkin. 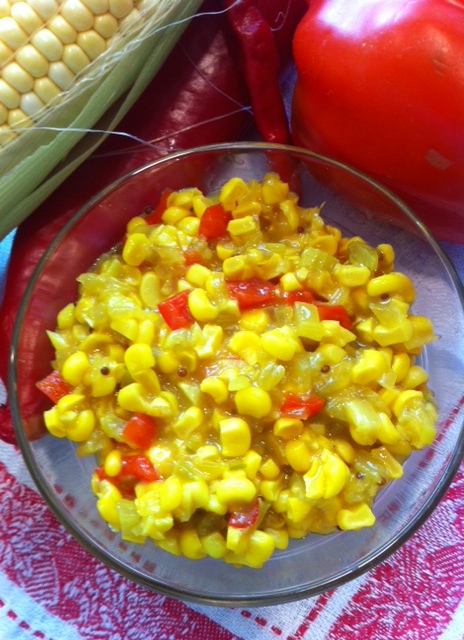 Combine corn kernels, pepper, celery, onion and set aside. Sieve the corn scrapings and blend flour into the corn milk. Hold aside. In a medium saucepan bring garlic, chili, ginger, vinegar, sugar, salt, turmeric, mustard and seeds to a boil. Add corn, pepper, onion and simmer 10 minutes; add corn milk + flour and simmer 5 minutes more until thickened. Cool uncovered. Keeps in glass jar for a month in fridge. Makes 3 generous cups. You are currently browsing the Mary Jo's Kitchen blog archives for September, 2015.